Ask most gay men who are avid travelers to list the top three destinations that they are dying to visit, and Petra, in the Kingdom of Jordan almost always makes the list. Petra is an archeological city that was established around the 6th century BCE as a capital for the Nabataeans. Petra has been a UNESCO World Heritage Site since 1985, and UNESCO considers Petra "one of the most precious cultural properties of man's cultural heritage." Today, it is widely considered one of the world's most awe-inspiring architectural gems. Zoom Vacations®' trip to Jordan is a perfect add-on to the Zoom Israel trip and explores the history, culture, cuisine, and gay nightlife with sensational guides, while enjoying the finest hotels in Jordan. Arrive at Queen Alia International Airport in Amman. You will be met by our representative inside the airport, holding a sign with your name on it and be assisted through customs and immigration. Your driver will take you to the elegant Four Seasons Hotel Amman by private vehicle, for overnight. Tonight, dinner reservations have been made for our group for who have arrived and are interested in joining. Arrival at Petra. Built from 800 BC to 100 AD by Nabetean Arabs as a fortress, Petra was carved out of craggy rocks in an area which was virtually inaccessible. In the first and second century, the city reached the apex of its prosperity under Roman rule. When shipping slowly displaced caravan routes, however, the city’s importance gradually dwindled. Petra fell into disuse and was lost to the world until 1812, when it was “re-discovered” by the Swiss explorer Johann Ludwig Burckhardt. Today, Petra is Jordan’s number 1 tourist attraction, known as the “rose-red city half as old as time”. The city covers an area of about 100 square kilometers, where over 800 monuments can be found. On arrival, we will enter this UNESCO World Heritage site on horseback. Full Breakfast is served at our hotel. We drive to the Dead Sea, enjoying, movies, snacks, and laughs on the way. The Dead Sea has for centuries been a spa retreat, so it is befitting that we stay in the best hotel in the area, with the best rated spa in the Middle East. The Dead Sea is world renowned for its healing properties. It's also a LOT of fun. 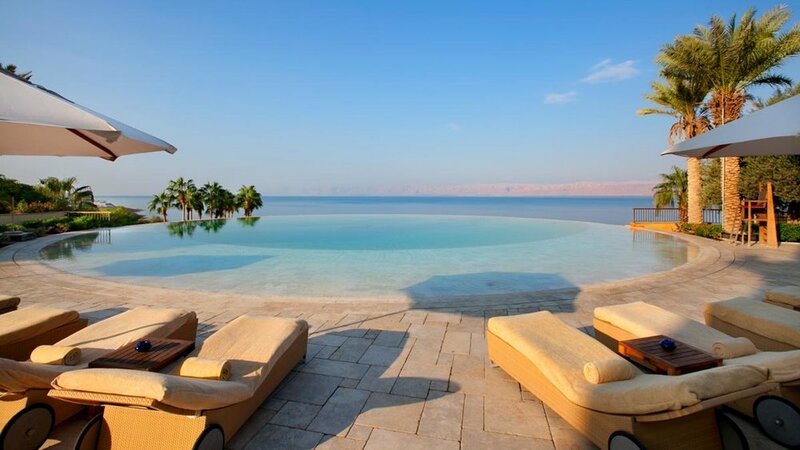 Afternoon: Afternoon at leisure to float in the Dead Sea, take in a spa treatment, and more. Early morning: At leisure to float in the Dead Sea, take in a spa treatment, and more. After your morning enjoying the Dead Sea, you will be assisted with your luggage and check out, and transferred to Queen Alia International Airport for our departure, or via air conditioned vehicle if continuing on to Israel. A few of the restaurants on this tour are our some of our favorites in the world! After visiting local markets, you will see why the food in restaurants is so flavorful and fresh. Even the camels sometimes can seem a little gay. This is generally considered the "money shot" at Petra. The Dead Sea Mud is dreamy to put on your skin and you will be amazed how just one application can improve your appearance. Experience a crown jewel in the heart of Jordan’s bustling capital city: Four Seasons Hotel Amman, a majestic luxury hotel set atop the highest of the White City’s famous seven hills. Set between the upscale Sweifieh neighborhood and Shmeisani financial district, this luxury hotel atop the city’s highest hill is 2 km from Baraka Mall and 6 km from King Abdullah I Mosque. The Mövenpick Nabatean Castle Hotel is a 10-minute drive from the entrance to the historic site of Petra. Situated at an altitude of 1,400 m, this hotel offers breathtaking views over sweeping hillsides. The hotel was designed by the recipient of the Agha Khan Award for Islamic Architecture, Engineer Rasem Badran. Embrace the magic of Jordan’s most enchanting setting, where nature and history have so wonderfully conspired. Kempinski Hotel Ishtar Dead Sea is the most ideal venue from which to explore the rich culture and deep history of the area. This 5 star luxury hotel is situated on the edge of the famous salt lake - the lowest point on earth - and provides uninterrupted views across the vast sea towards the west bank and access to some of the most beautiful scenery in the world, including religious sites and majestic countryside. Visas: Please note that currently US citizens must have a Visa to enter Jordan. If you are not a US citizen, please contact your nearest Jordanian Consulate to determine your visa requirements.